What makes a cheese shape cheesy? So, what does make a cheese shape taste cheesy? Simple enough question you’d think, but no, it had 99% of my little cooks completely stumped this week, raisins? Chocolate? Tomatoes? Even with a bit of phonetic help, starts with ‘ch’….. ends with ‘eese’ they looked well and truly bamboozled! It just goes to show how the seemingly simplest things don’t always appear so, it really is only easy if you know the answer! Having made a lovely cheddery dough, cut out lots of fabulous shapes and sent them over to the oven we set about tasting some cheeses – chedder, always popular, leerdammer with holes, one little boys mirth over these holes was particulalry sweet, Gouda and Port Salut – Gouda being 2nd in the popularity stakes. We chatted about where the cheese comes from … and then where it came from before it was lovingly put on the shelf at various well known supermarkets, and they got it in one, we make cheese with milk. We get milk from cows, and sheep, and goats… and apparently camels. We get eggs from ducks, chickens and dinosaurs though we all agreed you’d need a mighty big pan if using a dino egg, so maybe best just to stick to the chickens. As for the camel milk, well, you learn something every day! Some of the best answers are the completely innocent and often totally correct ones, where do we get milk from…. mummy. What food do we get from a chicken…. spicy wings. I don’t always get the answer I was hoping for. If I did I’m sure my job wouldn’t be nearly so entertaining! Posted in Uncategorized and tagged cheesyshapes, Cooking, kids. Bookmark the permalink. It’s days like this that send Mums into panic. You wake up, it’s cold, dark and wet and by tea time the sun is shining and those of us who ventured out in raincoats and jumpers are hot and sticky and wishing we didn’t have quite so much to carry! It used to be the case we’d look out of the window and decide whther it was a shorts or trousers day, but since moving up a school, my son now has a winter uniform and a summer uniform. Summer involves a polo shirt and shorts, winter a shirt and tie and trousers. At seven years old, buttons and ties are unconquerable it seems, and so, whether he freezes or not, a summer uniform it is… Where my child is concerned a simple tie really will make a man of him! Food is the same, after a cold play at the park, splash in the puddles or anything else you may do when the sky is black and you need some fresh air, you need warm hearty food, the most versatile of which is a good old fashioned crumble. If it’s cold they can be served with hot custard, if the sun’s appeared a nice scoop of ice cream Eaten hot or cold the crumble is the king of puds as far as I’m concerned and great to make with your children. When I tell people what I do they often look confused, in fact I once interviewed an ex-home economics teacher, who taught in a secondary school. She insistantly told me how few things you could do with an eleven year old and so they made pizza using ready made bases and cheese on toast and that was pretty much that – she wasn’t offered a job! I suppose I expect quite a lot from my little cooks, they are given most of their ingredients and then must measure out the final one,I use old fashioned balance scales and the kids love coming to the front and carefully scooping in the flour. They measure, they squidge to rub in, they mix, they roll, they cut, they grate, they chop… they do it all from start to finish with no complaint and happy smiles. 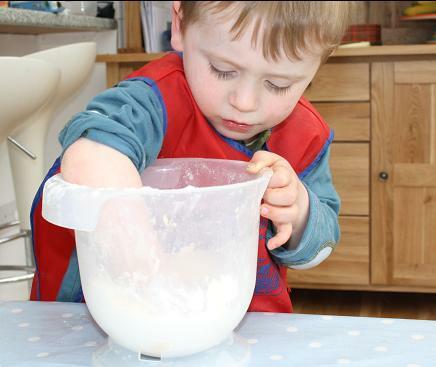 Preschoolers are capable of so much more than most of us believe, with a bit of help they can make the most perfect pastry. Anyway, back to the crumble. here is my very simple recipe that even the kids can make. Fruit – your favourite, a mix of apples and pears is lovely, as is plum. Layer the fruit up in an over proof bowl and then simple rub together all the other ingredients until it starts to go lumpy – then stop before it forms a ball. Add a teaspoon of cinnamon mix in then lay on top of your fruit. Cook at 200 oC until nicely browned, time will depend on size of crumble! Posted in Uncategorized and tagged cookingwithkids children, crumble. apple. Bookmark the permalink.